An octopus has a big brain, but the brain is not where all the action is. Their nervous systems are built on an entirely different design from ours, and the majority of the neurons (nerve cells) in an octopus – something like 2/3 of them – are in the arms themselves. What are those neurons doing? Here is a quote from Roger Hanlon and John Messenger‘s 1996 book Cephalopod Behavior. I was very struck when I first read this passage, and it is one of the things that make octopuses so significant when thinking about the relation between minds and bodies. If the arms are “curiously divorced” from the brain, what sort of psychological unit is an octopus? How much independence do the arms have? If they have a lot, then is an octopus a collection of semi-autonomous and semi-intelligent parts, which work together in natural settings but don’t form an integrated “self” in the way a more centralized animal does? Invertebrate animals generally have less centralized nervous systems than vertebrates; what makes the octopus unusual is its having a nervous system that is both so decentralized and so big. Some philosophers who work on mind-body issues would say it’s a mistake to read too much off the layout of the nervous system (Andy Clark, Alva Nöe, Evan Thompson). The whole of an organism’s body, and the feedback it engages in with its environment through the senses and action, go into determining the organism’s psychological features. In a later post I’ll discuss the best experiment I know of that bears on these issues, published last year by Tamar Gutnick and her colleagues at Benny Hochner’s lab in Jerusalem. It shows that a radically disunified view of the octopus is not right – “divorce” between arms and brain is too strong a term. But it suggests a mixed view of octopus agency, one in which there is a combination of top-down control of the action, along with some delegation of details to the arms themselves. Here is a video (1 minute) taken a month or so back in natural conditions. Watching it, I go through a kind of gestalt-switch, back and forth, between seeing each arm as an autonomous explorer and seeing them as parts of a unified animal. At a few points the octopus pretty clearly appears to send an arm along a definite path. But the last part of an arm sometimes seems to have its own ideas. Posted in Bodies and Minds, Octopus and tagged mind, octopus. permalink. 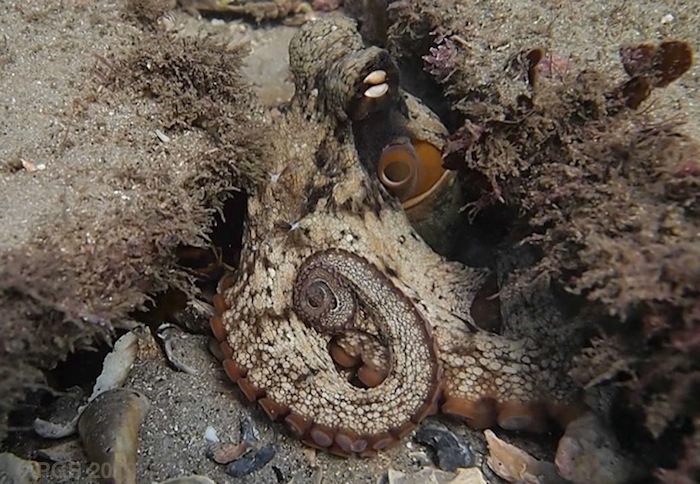 Here is a video (O. briareus) where I tried to show why I think octopuses (at least this species) do not hunt primarily with vision. Tatanka could easily detect someone entering the room as well as observing the dogs (below the tank level) moving about but he had a hard time detecting and finding supper placed close to the eyes. This is an unknown species (Caribbean). Monty sees the crayfish and is aware of where it goes (note he did not take the same route as the cray but traveled around the back of the LR) but watch how he approaches catching it. Notice the eyes don’t even appear to be looking at the prey and, even though it is in plain sight, he uses his arm to locate it for the catch. Lastly, SueNami (O. briareus again) was the first animal that started me thinking that octopuses are not primarily sight hunters. In this video he ultimately catches the shrimp but I have an unposted video where he misses over and over using the spot and pounce method. 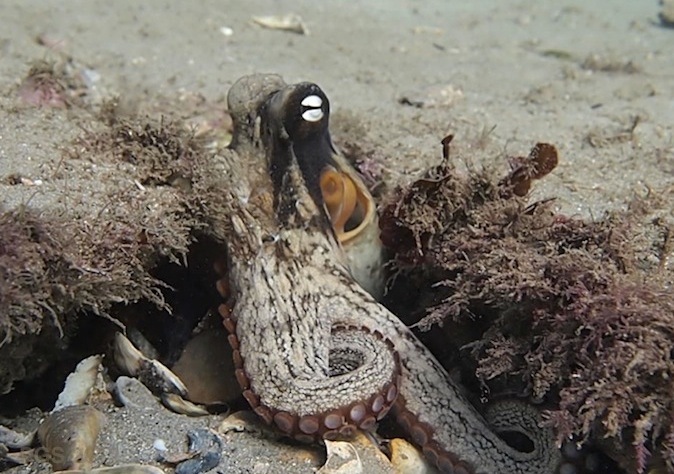 You can see the arms are individually manipulated but either sight accuracy or coordination are not very effective (compare this to the cuttlefish who must be very accurate and have specialized tentacles for prey capture). Eventually SueNami was quick to capture the shrimp, changing his technique to spreading his arms and letting the prey touch one of them instead of trying to follow the prey visually (note the very different strategy and speed of the arms). The last video might suggest that the arms, allowed to do their own “thinking”, are faster and more accurate than when being coordinated by the primary brain. In that last video (http://www.youtube.com/watch?v=ZCEB_23fvaE) the capture is amazingly fast, and I guess it would have had to have been either vision, or luck, that got the arm where it needed to go. The arms’ localized sensors could not have done much here(?). He does look far-sighted in the first video, I agree. How can that shed a light on the mind-body problem? The mind of an octopus seems to be as closed to scientific enquiry as – say – the mind of an ape. If the minds of animals are closed to scientific inquiry in all cases, then indeed it does not help. But if it is possible to investigate the minds of animals by learning about their nervous systems, behaviors, and so on, then octopuses are special because they work on such a different design from us. I don’t think ape minds are so closed, either. Cheney and Seyfarth’s excellent book Baboon Metaphysics tries hard to get inside what is going on in an ape, mostly using behavioral evidence. Probably the best thing I have read of that kind. I recently posted a layman’s observation that would parallel this thinking. I believe that the eye-sight, at least in the smaller octopuses, is not as keen as is written. They are listed as sight hunters but watching them in an aquarium suggest they are more tactile hunters that may use sight to locate potential direction for their tactile hunting and not for actual catching of prey. ps – though these guys do seem to have fairly good eyesight, at least for each other. Here is a short YouTube: http://youtu.be/IM5Mct-SSTc. One octopus seems to notice and keep a close eye on another, who scoots across the sea bottom and ‘boxes’ briefly with a third, before heading back where he came from.